Stop tucking in that tee shirt! Why in Gods name do men begin tucking in their tee shirts when they get older. Did you ever see any man between teenager and thirty nine years old tuck his tee? Man, tucking that tee makes your pants look like they are up to your neck. And besides that, do we really need to see your beer belly hang over your belt buckle? Check out those pics of you when you were younger. I bet you let that tee hang back then, so why the change now? Tucking that tee doesn’t make it a dress shirt either. It is what it is. Tee shirt and jeans with the tee out. Lets keep it that way…. More often than not, I find myself in a cookie cutterÂ Â style restaurant. So many of them seem to be copied examples of Fridays, Applebees or some kind of pseudo sports bar/restaurant. As hard as it can be to find them, I try to locate restaurants that have the owners imprint on it. Style of decor, interestingÂ menu choices,Â great spices and flavors in the dishes and just plain god given creativity. Ian’s hits the nail on the head! From the moment you arrive you know that you will be experiencing something different. When you walk up to the entrance, you immediately notice that this is a house turned restaurant, and its outside patio area was probably some child’s playground at one time. A backyard that once possibly housed a sand box has been replaced with a wonderful outside dining area, with lush palms and soft light. Inside, dining room booths are draped in sheer fabric which gives a sense of privacy over alternative table seating. Our waitress immediately brought us menus, ice cold water( filtered and served in a glass carafe and placed on our table) and bread. As much as I hate having to decide on what to order because there are too many things I would like to try, I hate it even more when I can’t find anything on the menu that captures my attention. The former being the case here as Ian’s provides you with so many choices of seafood dishes that you find your self bargaining with your table mate to try to convince her to order the other dish you wanted. That being said, we ordered the baby greens salad and sesame seared edamame to start and Day Boat Scallops and Pan Seared Grouper for entrees. When the Edamame arrived we were surprised to see the beans out of the casing. The presentation of the seared beans in a miso butter with pistachio’s lent itself more to a side dish of vegetables than an appetizer. We decided to add them to our dinner dish later rather that scoop them onto a side dish to eat as an appetizer. Although what we felt was an awkward way to eat an app they are very delicious and did add significantly to our dinner another great flavor. The salad portion although fresh and tasty wasn’t enough to satisfy and could have used more of the advertised cranberries and walnuts. Dinner on the other hand was incredible. Flavor wise, it was second to none. The blending of spices, fruits, and textures of each dish was superbly done and masterful. Quite to my surprise, did I ever expect such creative cooking in Jensen Beach. The Day Scallops were crunchy and when combined with the Raspberry Coulis and Mashed Vanilla Sweet Potatoes, it was a flavor explosion. My dish, the Grouper was even better. Served over sauteed Spinach and a Marscapone and fresh Mozzarella Cheese Polenta, that was so creamy and delicious and topped with a Mango salsa.Â As great as the Polenta was, I would have preferred less of it and more of the Grouper, as it is one of my favorite fish. All in all, the meal was outstanding and I look forward to my next trip to Florida and a second visit to Ian’s. One last note. We were coerced into trying the Chocolate Pate with Raspberry Sauce for dessert and if you do you won’t be disappointed. This extremely dense, rich dark chocolate served with fresh Strawberries and whipped Cream, will satisfy you and put the exclamation point on your evenings meal. The coffee wasn’t bad either! 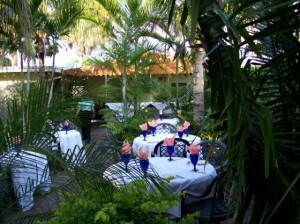 So check out Ian’s Tropical Grill when in the Jensen Beach or Stuart area. Ian’s has moved to a new location. My wife and I will be dining there this evening, for our Valentines dinner. See the contact information listed below.